A brand new menu is available from Diet To Go. This new menu features a variety of foods that are carefully portioned and designed to be nourishing and easy for people to consume. Various lean chicken and fish entrees are included. The blackened salmon and tuna meltovers are especially popular. Many breakfast meals include waffles, bagels, walnut cereal and many other high-fiber choices. Bean salads, black bean chili, mushroom ravioli and stuffed shells with tomato sauce are among the many popular options on the vegetarian menu. These foods are designed with five-week rotations in mind. This ensures that each person will have a good variety of foods to enjoy each week. As always, the foods served by Diet To Go are always healthy and easy to prepare. They are fresh and appealing to all and are never frozen. People can also enjoy the myDiettogo system. This is a personal online system that members can use to track their weight loss plans. This includes reviews of how they are consuming certain foods and how they can manage exercise and lifestyle plans the right way. Members can manage their account information in real time and order specific types of foods that they might be interested in. People can keep track of their programs on their tablets and smartphones. Information on the features of each food are always included online to help clients learn about how to prepare certain meals. This should improve upon how well one’s weight loss plan works, what with the information being fully detailed and essential for all participants to work with. People can also get in touch with others in the Diet To Go program through the social media avenues promoted by the company. This allows people to talk with each other about weight loss strategies, food ideas and much more. This helps make it easier for people to get the most out of their dietary needs. The new features of Diet To Go for the 2017 season are essential features that will make a difference in the lives of anyone aiming to lose weight. This especially helps all those looking to get the most out of their bodies and to become healthy. If you are looking for more weight loss options, try out Nutrisystem. 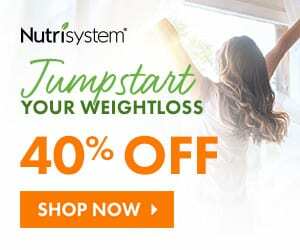 Today with a Nutrisystem Promo Code, you can save up to 40% off purchases.